Economic reports showing widespread weakness. 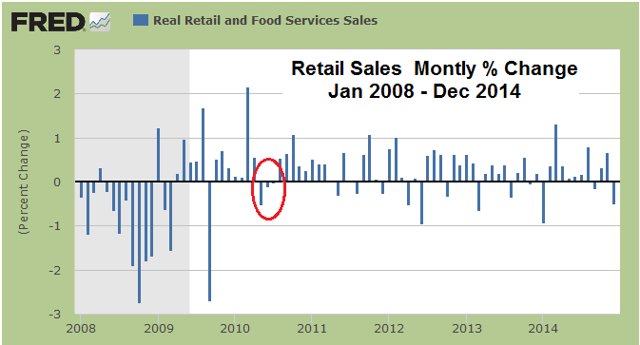 Retail sales were negative two months in a row. The wholesale inventory to shipments ratio indicates falling consumer demand. The Baltic Dry Index reflects a rapid decline in consumer demand. "November/December was the worst Christmas shopping season since the economic collapse in 2008. It looks like 1st quarter retail sales will contract relative to 4th quarter, both before and after inflation, and that's very bad. It's an early signal that you might have an outright contraction in the GDP." The Federal Reserve's FOMC committee continues to promote the view that "economic activity has been expanding at a solid pace" (January 28, FOMC policy meeting announcement). Although the Fed is posturing itself on the idea of a strengthening economy, it continues to refrain from raising interest rates even just 25 basis points. In this context, I have noticed several economic indicators which suggest that the economy is starting to slow down quickly. Moreover, taken in aggregate, several indicators are suggesting a high probability that the economy will contract - i.e. go into recession - this year, both in real (inflation-adjusted) and nominal terms. Perhaps this is why the Fed seems loathe to raise interest rates even after 73 months in a row of lowering rates and maintaining ultimately a 0-25 basis point Fed funds target. Many of the economic reports that have been released since the beginning of 2015 are showing definitive signs of a marked slowdown or even contraction in economic activity. For instance, The Fed's monthly report on industrial production - released on February 18th for January - came in at .2% growth but missed the Wall Street consensus estimate of .4%. Not only was industrial production weaker than expected, but December's initial -.1% was revised lower to -.3%. December's manufacturing component of this index was initially reported as +.3% but was revised down to 0%. In terms of important sub-indices of the industrial production report for January, motor vehicle production fell .6% and construction supply fell .3%. This was a bit of a surprise because in January auto manufacturers typically would be ramping up production of the current model year from the factory downtime in December for the model year changeover. Similarly, if builders were planning to expand their construction activities this spring, it would be reflected in stronger production of construction materials now. Automobile production and homebuilding have been the two primary drivers of the post-2008 economic recovery. Finally, the utilities sub-index of the industrial production index was up 2.3% for January over December. It was the only sub-index which registered any meaningful growth and if this component were removed, or if January had warmer than normal weather instead of colder than normal in the northeast, industrial production would have declined for the second month in a row. I would thus argue that this report is hinting at the possibility of a manufacturing sector that is significantly slowing down if not outright contracting. 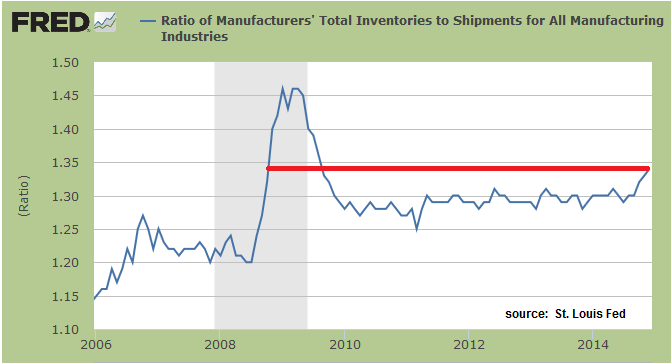 The graph above shows manufacturers' inventories as a ratio of shipments and orders. When the ratio is rising like it is now, it indicates that wholesale inventories are growing at a faster rate than shipments and orders. With retail sales having declined two months in a row (see below), it is likely that shipments have slowed considerably relative to production output. The ratio is currently at 1.34. The last time this ratio was rising and measured 1.34 was in October 2008, which was in the middle of the last official recession. In other words, with this ratio rising quickly as shown in the graph, it is likely that the U.S. economy is headed quickly into another recession. In fact, as you can see above, the BDI is now at an all-time low for this index. As of yesterday (February 18th), the BDI fell to 509. It has been in a literal freefall since the beginning of November. 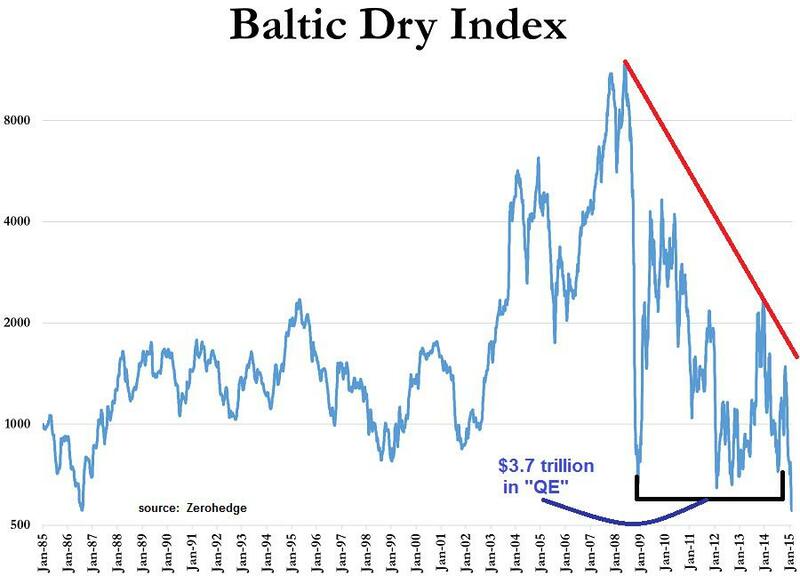 While part of the reason the BDI is falling like this has to do with the possibility of an oversupply of cargo ships, it also indirectly measures the organic level of consumer demand as reflected by the falling cost of shipping. The U.S. is the biggest importer in the world. If the BDI is dropping rapidly, like it is now, it reflects the likelihood that consumer demand, especially in the United States, is falling rapidly. In the context of weak retail sales as discussed below, I believe the plunging BDI is indicative of a U.S. consumer-driven economy that is likely rapidly slowing, with economic activity headed into contraction. The three-month decline in 2010 was two months after the Fed's QE1 ended (March 2010). While it may be a mere coincidence, the Fed's QE3 ended in October 2014, two months prior to the latest monthly sequential decline in retail sales. While retail sales rebounded after three months of declines in 2010, the Fed rolled out QE2 in November 2010 - ostensibly in response to the perceived risk of a weakening economy. Time will tell whether or not retail sales will continue to decline into 2015. But taken in the context of the other economic indicators discussed above, it is highly probable that consumer demand - which drives close to 70% of the GDP in the United States - is rapidly growing weaker. It is thus my view that this will translate into a U.S. economy that will fall into a recession as 2015 progresses. Furthermore, this would explain why the FOMC continues to maintain a 0-25 basis point Fed Funds target policy despite its rhetorical assurances that economic activity is expanding. In terms of applying this economic outlook into investments, I would recommend buying longer-dated Treasury bonds. The Treasury yield curve has steepened recently and longer-dated Treasuries have sold off quite a bit. The easiest way to play this part of the yield curve is with the iShares 20+ Year Treasury Bond ETF (NASDAQ:TLT), which has dropped from $138 on January 30th to its close today (Feb 19th) of $126 - an 8.6% drop in just twelve trading days. As the market becomes convinced that the Fed will back off from its whispers that it intends to raise rates this year, I believe TLT will quickly rally back to and over $138. There are also options available if you want to "leverage" this as a trading play. There's also the ProShares Ultra 20+ Year Treasury ETF (NYSEARCA:UBT), which is 2x a 20-yr Treasury index. It's dropped 17.5% since the end of January. I recently took a position in UBT. This ETF also has options available. Disclosure: The author is long UBT. The author wrote this article themselves, and it expresses their own opinions. The author is not receiving compensation for it (other than from Seeking Alpha). The author has no business relationship with any company whose stock is mentioned in this article.